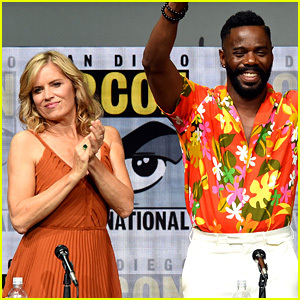 'Fear the Walking Dead' Cast Debuts Season 3 Trailer at Comic-Con! The cast of Fear the Walking Dead appears on stage for their panel at 2017 Comic-Con on Friday afternoon (July 21) in San Diego, Calif.
Kim Dickens, Colman Domingo, Frank Dillane, Alycia Debnam-Carey, Sam Underwood, Daniel Sharman, Dayton Callie, Mercedes Mason, and Michael Greyeyes were on hand to premiere the season three trailer for the fans in the crowd! 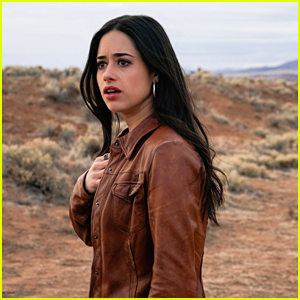 Luckily for us, the trailer was released online right after it played on the big screen, so you can watch it here. The second half of Fear the Walking Dead‘s third season will debut on Sunday, September 10 at 9/8c on AMC. 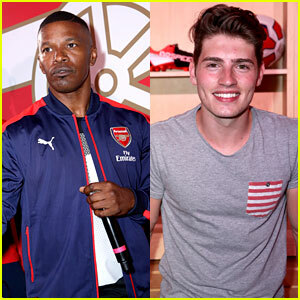 Jamie Foxx gets ready to throw down some beats inside the PUMA and Arsenal Football Club 2016/17 AFC Away & Third Kit Reveal on Friday (July 29) in Culver City, Calif. The 48-year-old actor joined soccer super fan Gregg Sulkin as well as Daniel Sharman, Kendrick Sampson, Shemar Moore and Disney’s Isaak Presley plus soccer players Fredrik Ljungberg, Hector Bellerin, Santi Cazorla, and Nacho Monreal for the sporting event. “Me & Hec. Swapping right back notes. #Gooner,” Gregg shared on Instagram from the event. Gregg Sulkin puts his amazing six-pack on display while shirtless after his soccer game last week in Los Angeles. The 24-year-old Faking It star was joined by his girlfriend Bella Thorne, who watched from the bleachers, and his teammate, The Originals actor Daniel Sharman. Gregg and Bella just got back from a beachy vacation in Mexico after celebrating his birthday a couple weeks earlier. Emily Ratajkowski, Mark Ruffalo, Rosario Dawson, and Josh Hutcherson all have one thing in common – they are supporters of Democratic presidential candidate Bernie Sanders. The stars – along with Susan Sarandon, Danny DeVito, Justin Long, Daniel Sharman, Max Carver, Justin Bartha, Heather Matarazzo, Kendrick Sampson, Emmanuelle Chriqui, Ethan Embry, Jay Ferguson, Jonathan Sadowski, Mehcad Brooks, and more – are featured in a new video in which the explain the meaning of Democratic Socialism. The celebs explain that democratic socialism is your kids’ public school, the public libraries and museums, national parks, interstate highway systems, the center for disease control, the men and women of the armed forces, and much more. 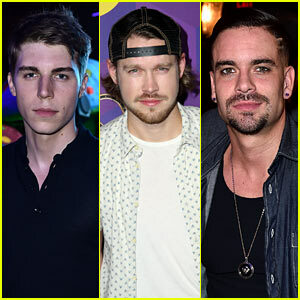 Nolan Funk, Mark Salling, & Chord Overstreet Stage a 'Glee' Reunion at JJ's Wonderland Party! Nolan Gerard Funk, Chord Overstreet, and Mark Salling all attend the Just Jared Way Too Wonderland Party presented by Ever After High on Thursday (August 27) at Greystone Manor in Los Angeles. All three of the guys starred on Glee at some point throughout the series and it was almost like a little reunion! FYI: Arden is wearing a Nine Muses Collection outfit. Jessica Szohr adds a pop of color to the beautiful blue backdrop while attending the Just Jared x REVOLVE Clothing Dinner on Saturday evening (July 19) at the REVOLVE Clothing Beach House in Malibu, Calif. The 29-year-old actress, who will soon be heading to Atlanta to shoot her new USA series Complications, joined her good friend and the dinner’s host Jaime King for a night of fun. British actress Alice Eve stopped by briefly to show her support for Jaime and the dinner despite having a previous obligation. Former Teen Wolf star Daniel Sharman wore a perfect suit for summer at the dinner. He sat alongside Jaime‘s husband Kyle Newman, who he has been friends with for some time. Just like Jessica, he will be heading to Atlanta soon to start work as a new cast member of The Originals. FYI: Alice is wearing a Tory Burch dress with the biography bracelet stack by Astley Clarke.